Zone Base: This is my jam and I'd put it on toast if I could. This is my jam and I'd put it on toast if I could. Sometimes I could kick myself for skipping over things in the past that later became more expensive than I'd let myself pay for. Case in point, look at this ad for Microman toys. See anything familiar? Well, just like how Transformers used molds from Microman, Takara used Transformers molds in other lines. 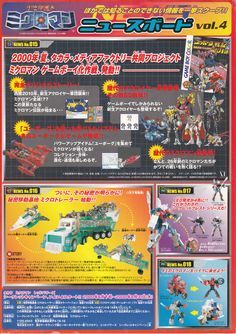 That green truck is Action Master Optimus Primes truck.The two bike robots in the bottom right are light cycle molds from G2. They actually modified the handlebars so that Microman figures could hold them when they drive. I think that's a forever in the mold thing now as uses of the molds in Robots in Disguise and Robot Masters had the new Microman handles. I totally had opportunities to get these super cheap back in the day and passed for other things (sometimes there's only so much money for trivial things and you make decisions, ok?). Sometimes I still see the figures from this Microman series online for fair prices, but not the things I'd really like that I passed over. Just look at that magnificent deco on the truck. It's not far removed from Thunderclash, and man it looks sharp. When I buy things like Legends, or look forward to the upcoming Authentics, this is the kinda thing I'd like for it. Sure, Cyberverse did a great job of providing cool vehicles that were similar in play pattern. But man...man... MAN would it be awesome to buy a Legends scale Optimus that came with a new version of his old truck play set.